1 of 5 Prepare outdoor grill with medium-hot coals or heat gas grill to medium-high. 2 of 5 In bowl, whisk together vinegar and salt. Whisk in mustard, black pepper, oregano and thyme. Slowly drizzle in oil, whisking until thickened. Reserve 4 tablespoons for dressing the salad and 4 tablespoons to serve with the fish. 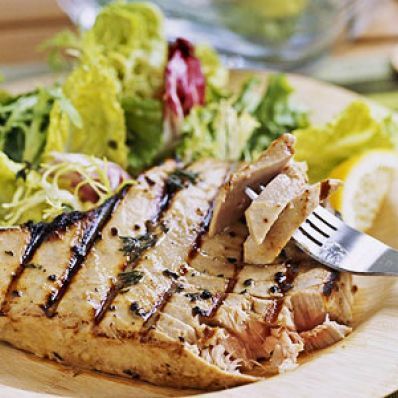 3 of 5 In a large glass dish, marinate the tuna in the remaining dressing for 15 minutes at room temperature. 4 of 5 Remove fish; discard marinade. Grill fish for 2 minutes per side. Remove to a plate; keep warm. 5 of 5 In a large bowl, dress the salad with 4 tablespoons of the reserved dressing. Serve topped with grilled tuna and remaining reserved dressing on the side.